Three Players - goalscorers Paul Taylor, Gwion Edwards and Tom Nichols - shared the Peterborough Telegraph man-of-the-match award after last night’s drubbing of Millwall. The goalkeeper made a great save one-on-one from Jimmy Abdou early on and generally had a quiet night thanks to his defence. Needs to catch more balls rather than punch, or at least punch further. 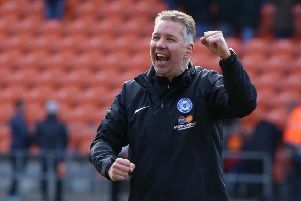 Was key in giving Posh width by getting up in attack, while never looking in trouble defensively against a side who came into the game unbeaten. He gave width in attack and was solid in defence, tracking finding space when Posh had the ball to provide a passing option at all times. Excited cries of shoot from the crowd as he dummied his marker, high up the pitch on the edge of the box, to create space for a shot which went for a corner. Certain in his defensive work. Great block at full stretch to see out the danger from a rare Lions attack. Put his body on the line to keep the ball out of the net. He and centre-back partner Bostwick deserved a clean sheet. A brace of goals for the midfielder means he has now scored three times in his fledgling Peterborough career. His energy and pace on the break was a key part of Peterborough’s dominance. The number eight gets an eight. The skipper won the ball back to shelter the defence, made an important block at a key moment in the match just after half-time and looked composed at all times. Some beautiful passes to add and a calm head. In a devilish mood, running, distributing, and most importantly scoring. His standing ovation tells you everything you need to know about the masterclass he put on. After the match his manager Grant McCann, called him unplayable in that type of form. The man who started the party, first with an audacious shot on the angle from 30 yards inside of 40 seconds and then a goal five minutes later. His willingness to attack sparked Posh into life from the kick-off. Full of energy and a provider of great link up play in the middle of the park, so often the man sparking the breaks. He looked comfortable with the ball, with plenty of time to make intelligent passes. Three assists and a goal, how’s that for a night’s work. On any other night his performance would have warranted a man-of-the-match award. Absolutely integral to the victory.